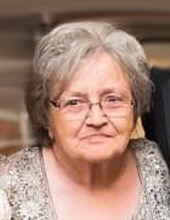 Mrs. Pansy Rhoades Wagoner, age 78 of North Wilkesboro passed away Monday, April 1, 2019 at Rose Glen Manor. Funeral services will be held 11:00 AM Saturday, April 6, 2019 at Reins-Sturdivant Chapel with Rev. Mark Wood officiating. Burial will be in Mountlawn Memorial Park. The family will receive friends from 6:00 until 8:00 PM Friday evening at Reins-Sturdivant Funeral Home. Mrs. Wagoner was born April 13, 1940 in Wilkes County to Fred Hoy and Lillie Shumate Rhoades. She attended Dehart Baptist Church. In addition to her parents, she was preceded in death by her husband; Clyde Ransom Wagoner, grandchild; Christopher Laws and sister: Kathleen Rash. She is survived by two daughters; Sharon Lytton and husband David of Wilkesboro and Linda Laws of Hays and one son; Michael Wagoner and wife Sandra of North Wilkesboro, grandchildren; John Adams and wife Kristin, DeShea Jones and husband Matthew, Jamie Wagoner, Kara Cahill and husband Justin, Amanda Brock and husband Nick, Dustie Blankenship and husband Jerry, great grandchildren; Joleigh Jones, Henry Jones, Liam Adams, Madeline Adams, Rosie Blankenship, Dominic Blankenship, Jasmine Blankenship, Montoya Laws, Chris Laws, Zachary Absher, Benjamin Absher, Jaxson Cahill, Paisleigh Cahill, Calvin Brock and one great great grandchild; Liam Blankenship and a sister; Louise Byrd of North Wilkesboro. Flowers will be accepted or maybe made to Mountain Valley Hospice, 401 Technology Lane, Suite 200, Mt. Airy, NC 27030. To send flowers or a remembrance gift to the family of Pansy Rhoades Wagoner, please visit our Tribute Store. "Email Address" would like to share the life celebration of Pansy Rhoades Wagoner. Click on the "link" to go to share a favorite memory or leave a condolence message for the family.